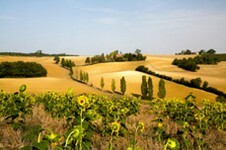 Gascony - where is it? Gascony is an ancient region of France, which stretched roughly in the shape of a rectangle, from Toulouse (Toulouse Property Guide) to the Pyrénées (Midi-Pyrénées Property Guide), and from the Atlantic to Bordeaux (Bordeaux Property Guide). The region comprised what is currently known as the Gers (Gers Property Guide), with parts of Landes (Landes Property Guide), Haute-Garonne (Haute-Garonne Property Guide), Lot-et-Garonne (Lot-et-Garonne Property Guide) and the Gironde (Gironde Property Guide) falling within its historic boundaries. Although it is no longer found on a map of France, the Gascony region is still frequently referred to and retains its identity as a cultural, historical and supremely gastronomic part of France. The mention of the name of Gascony summons up an image of a very distinct and unique character. The landscape is truly beautiful. With its gently rolling hills, topped with tall elegant cypress trees, and its flat valleys with their golden fields of corn and sunflowers, it has earned the nickname of the Tuscany of France. Certainly, there is a great similarity, although unlike Tuscany, Gascony has not yet been taken over by the "chattering classes"! Gascony is one of the few remaining utterly unspoiled regions, and it offers a peaceful rural lifestyle that is difficult to find in the modern world. Gascony has a colourful history, and the many influences which have been brought to bear on it throughout its existence have made it a unique and fascinating place with a complex identity. It has fallen, variously, under Roman, Spanish, French and English rule, and these diverse cultures have all left their mark on the people, the land, the way of life and the gastronomy. Gascons are a proud yet rural people, for whom the simple pleasure of good food, good wine and an honest lifestyle are worth more than making a fast buck in the ever more pressured environment in which most of us live today. This results in the interesting fact that the average life expectancy in Gascony is an amazing 94 years. Contrary to much modern medical thinking, the people put this down to their regular consumption of copious amounts of duck and goose fat, washed down with healthy quantities of locally produced wine! The sunny and pleasant weather also helps, and the mild winters and excellent summers enjoyed in the region are surely a factor in keeping the people healthy and happy. (Weather in France). 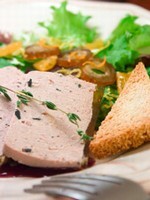 It may sound like a contradiction in terms, but the Gascon gastronomy merits the description. In Gascony, you will eat like a King... but in a time honoured and simple fashion befitting the rural traditions of the region. The richness of the ever popular duck and goose dishes (think cassoulet, confit de canard, Foie Gras) is offset by the simple fashion in which they are served, without the need for creamy sauces or over seasoning. This is a gastronomic tradition that relies on the quality of its basic ingredients, and there is nowhere in France that celebrates this quality more than Gascony. (Buying and cooking French food). Auch, the capital city of the Gers department (Gers Property Guide), lies in the real heartland of Gascony. The town, with its beautiful cathedral that took some 200 years to build, is well worth visiting and offers all the mod cons that you can require. The town was historically the administrative and commercial centre of Gascony due to its important strategic position between Toulouse and the Pyrénées. (Auch Property Guide). The nearest airports for accessing the ancient region of Gascony are those at Toulouse (British Airways, bmi, easyJet, flybe, bmibaby), Bordeaux (British Airways, Aer Lingus, flybe, bmibaby, easyJet), Bergerac (flybe, Ryanair) and Pau (Ryanair). Rail travel is also a good method of travel for people wanting to get to Gascony, as the TGV runs to Toulouse, Bayonne, and Bordeaux. It is also possible to make most of the journey to the region by boat, as you can travel to Santander\Bilbao by ferry if you prefer, making the final part of the journey by car. Gascony is one of the few places where there are some real bargains to be found, and not just on the poorer quality properties either. Here it is still possible to find a fully renovated farmhouse for around half of the UK equivalent price... or a ruin for renovation to fulfil your own individual French dream. The region is ideal hunting ground for lovers of La France Profond, for those who value peace and tranquillity, who love the countryside and want to enjoy an appreciation of a long-standing and proud culture and tradition. The properties on offer in the countryside include some wonderful Gascon farmhouses and farm buildings, frequently timbered and full of character. In the towns and villages look out for properties built from the local stone, or with historic features. Land is available for self build, but it is in the market of renovation of rural properties in which the region excels itself. These are difficult and even impossible to find in many areas of France these days, but Gascony is positively bursting with possibilities at very affordable prices. If this is your dream, there is no better place to begin your search.